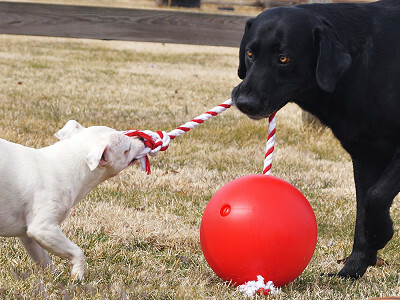 Tuggo is a one-of-a-kind dog toy that uses a large, weighted ball and rope to enable Fido to play tug of war all by himself or with a canine or human friend. Created by dog owner Adam Harrington, the idea came to him as he watched his own two dogs, Harley and Hailey, trying to grasp a bowling ball in his backyard. To make it easier, he threaded a rope through the ball and watched as his prototype kept the pups busy for hours. It’s no wonder this innovative product was an award winner at the 2014 Global Pet Expo. Fill Tuggo with water through a recessed screw cap to create more or less tension, as needed. For small pups, use little or no water. For big dogs, fill Tuggo up to 20 pounds. Then, sit back, relax, and satisfy your four-legged friend’s urge to play, chew, push, and pull. 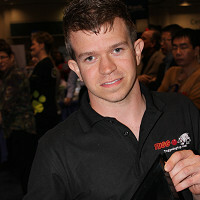 Hi everyone, I am Adam Harrington the inventor of Tuggo. If you are looking for a new one of a kind dog toy to keep your dog entertained for hours, then you have found the perfect toy! My dogs love Tuggo! Just let me know if you have any questions about Tuggo. I am here to help and share my story about how Tuggo was invented! This is great - I have four dogs and three are little guys, but the big one loves to play too. 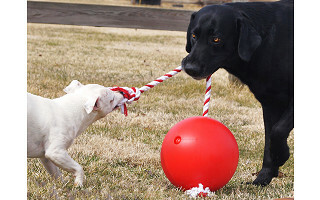 She always lets them win when they play tug games, but it would be great for her to have an "opponent" she could really tug against! She is about 50 pounds, and a strong puller...do you think Tuggo would stay grounded for her? How do you know how much water to add? I have a 7 month old puppy who weighs around 13 pounds. I too would like to know where this is manufactured. I have cats, not dogs, and one of them loves to tug, grab and pull on rope-type objects. Have you tried this with any cats? Is the rope easily replaced with new rope when it gets chewed to pieces? @Adam Can any rope be used? I know my dogs will shred the rope quickly and may need to consider a different type of rope. I have a Great Dane male about 120 pounds, he is 16 months old, and he loves to pull and tug on things, I have bought so much on line that was supposed to be able to last for him when all that happened was it was destroyed in about 10 minutes,,, Do you think that this will last for him?? ,,, Thor, is as strong as an mule, and loves to throw things in the air.. this seems like it would be ideal for him, but, I would hate to spend that much money on this and it not last is there a money back guarantee of some kind on this? I have Great Dane as well and was wondering if this is Great Dane proof as well! You addressed this with questions about a puppy, but my friend has a chihuahua that maybe weighs 7lbs. How big is the water fillable ball, and can this size dog reasonably manage it? I think theoretically she would love it. Tuggo is a one-of-a-kind dog toy that uses a large, weighted ball and rope to enable Fido to play tug of war all by himself or with a canine or human friend. Created by dog owner Adam Harrington, the idea came to him as he watched his own two dogs, Harley and Hailey, trying to grasp a bowling ball in his backyard. To make it easier, he threaded a rope through the ball and watched as his prototype kept the pups busy for hours. It’s no wonder this innovative product was an award winner at the 2014 Global Pet Expo.